Picture, if you will, a darkened room reminiscent of NASA’s Mission Control. The wall is festooned with giant flat-screen monitors. Dozens of operators and technicians scan the displays and their data, which collectively generate a picture of the health and performance of a company’s workflow. This is a NOC, or network operations centre. It’s the nerve centre for a video content provider like Bell or Rogers or any other big MVPD, as well as any direct to consumer or OTT, next-gen, internet-based streaming service. 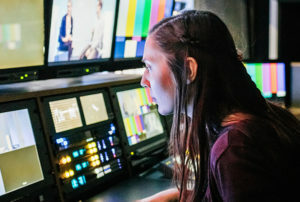 The purpose of the NOC is not only to monitor a company’s video streams – hundreds of them in real time – but to alert the staff on duty to the emergence of problems and help them untangle them. “Maybe a garbage truck backs into a telephone pole that’s carrying a fiber that carries 10 video services,” says Christopher Kulbakas, Director, Product Strategy, for SSIMWAVE. In the NOC, alarms sound. Technicians are suddenly task-saturated as they attempt to localize, make sense of, and troubleshoot the problem. “The amount of that information suddenly coming at you is overwhelming,” says Kulbakas, whose career has included many an hour spent working in just such a facility. When problems like these occur, staff in the NOC are beset by a phenomenon Kulbakas calls “swivel chair,” as they attempt to scan the various screens and understand and mitigate the outage. An episode like the one described here would potentially generate dozens of alerts, each demanding an investigation. “It cannot be consumed or made sense of, or correlated, in an easy fashion,” Kulbakas says. And that’s where SSIMWAVE comes in. SSIMWAVE is a Waterloo, Canada-based company that builds technology designed to safeguard and optimize a video delivery chain. It’s products not only monitor video quality – evaluating video perceptual quality from the standpoint of the human being it’s ultimately intended for – they help staff in a network operations centre distil and make sense of information as it flows into the centre. When problems occur, SSIMWAVE’s products reduce operator swivel chair, buying time and guiding personnel toward solutions by correlating and aggregating data. “The magic of SSIMWAVE is that ability to shift the correlation burden from the NOC agent, the human, onto the SSIMWAVE platform – the machines,” says Kulbakas. Hundreds of alerts, he says, are reduced to a handful. For a short-staffed, overburdened operations centre, the value proposition is easy to see. The alerts generated by the SSIMWAVE platform are designed as a bundle, allowing an operator to quickly access a high-level overview of an event or an outage, one that can then can be unpacked for a dive as deep as time and circumstances warrant. “But when we first expose that information to you, we do it in a simple way,” says Kulbakas. “Instead of overwhelming, we simplify, and that’s how we engage you. Kulbakas offers a recent example of a customer that had 175 outages over a short period of time; 70 of them were shown to be generated by one service. “That’s a massive insight,” he says. Monitoring is achieved through the use of a series of probes placed at key junctures of the video delivery chain. “First you monitor, then you derive insights, and based on those insights you derive recommendations, and based on those recommendations you do your optimizations. That’s the flow we follow. The ultimate benefit is that it allows a content provider to gain control of its network, freeing it up to move on to the next stage – optimization. “We help a NOC diagnose and fix any issue. Once you have a good grasp of that, the next step is, how do you optimize? Come and see us at NABShow 2019 to learn how we can help, Booth #SU6924 and the SPROCKIT Innovation Pipeline in North Hall.